The transition from home to college (or another learning experience) is a very big change. This will quite likely be the biggest change your teen has ever faced in his or her whole life. Life changes, even wonderful ones, are invariably stressful and each person handles stressful changes differently. For some kids, the stress of finishing high school may mean sleeping more and even crying more. For other kids, their stress can be expressed as impatience and bad temper. Whether your older teen has never moved before or has moved from place to place in the past, your child knows that this time will be different because she is doing it without you. Even if your daughter is very excited about moving out of her family home and beginning her new, more adult life, on her own, she probably feels daunted by the prospect of figuring out everything she will need to learn about living away from you. She knows what she is leaving behind, but she cannot really know what she is starting until she gets there. New beginnings also mean endings—this upcoming move from home marks the point at which your son’s childhood truly ends. Of course, he may not be going far and he will probably be coming home for frequent visits. And his college could be a wonderful experience for him. But leaving home after high school means that coming home will never be quite the same again for him. Ironically, the happier the childhood your older teens have had, the harder their transition from home may be. Sometimes I wonder whether the intense irritation and annoyance so commonly felt between parents and kids at this time is a way to mask the sense of loss and grief felt by all. It has been my experience that these feelings are rarely named or spoken of openly. Kids know they are supposed to be happy about leaving home—and they probably are. 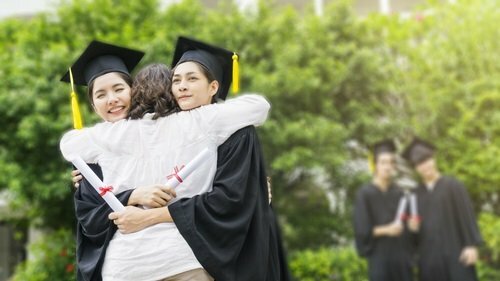 Parents know they are supposed to be proud and happy to see their children graduating and moving on—and they, too, are probably happy about it. Yet, in addition to these happy feelings, both parents and teens experience this inevitable transition as a sad one. Your children means the world to you, and you are incredibly important to them, too. Graduation from high school signals to everyone that you will soon be moving apart from them physically and emotionally. Your children may tell you all the time that you don’t know everything and you aren’t perfect, but they have never experienced life without your guidance and emotional support. More independence probably seems exciting to them, but it can also be scary, too. So, as you navigate these last few precious months, try not to take your older teen’s difficult attitude personally right now. You will certainly put reasonable limits on what you are willing and not willing to listen to. Yet, when you recognize that his irritability is likely a reflection of his own stress and his strong, yet ambivalent, emotions right now, you can be more compassionate. Your feelings, too, are probably in upheaval—making you feel more sensitive and easily hurt. Be gentle with yourself and with him, everyone is feeling extra vulnerable right now. Acknowledging why your son or daughter is probably stressed, and acknowledging why you are especially sensitive to his or her emotional outbursts, may help you both weather this transition better. Try not to expect too much, and be as patient as you can for the next few months. In the months and years to come, both and your child will have lots of time to develop new ways to stay connected and care about each other. Your child’s childhood is ending, and this means your former parent/child relationship is ending, too. Like all transitions, every ending means a new beginning with new possibilities for learning and improving. The end of your day-to-day to parenting responsibilities means that your new parent/young-adult child relationship is about to start.